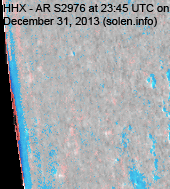 Last major update issued on January 1, 2014 at 09:05 UTC. 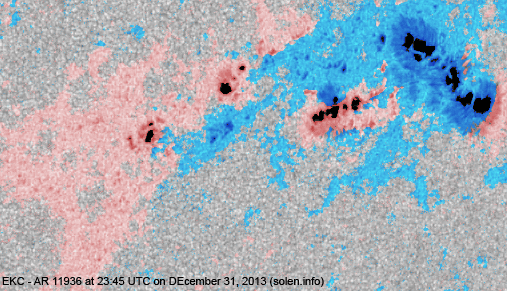 The geomagnetic field was quiet on December 31. 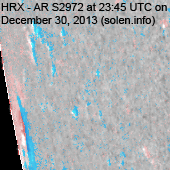 Solar wind speed at SOHO ranged between 329 and 432 km/s. 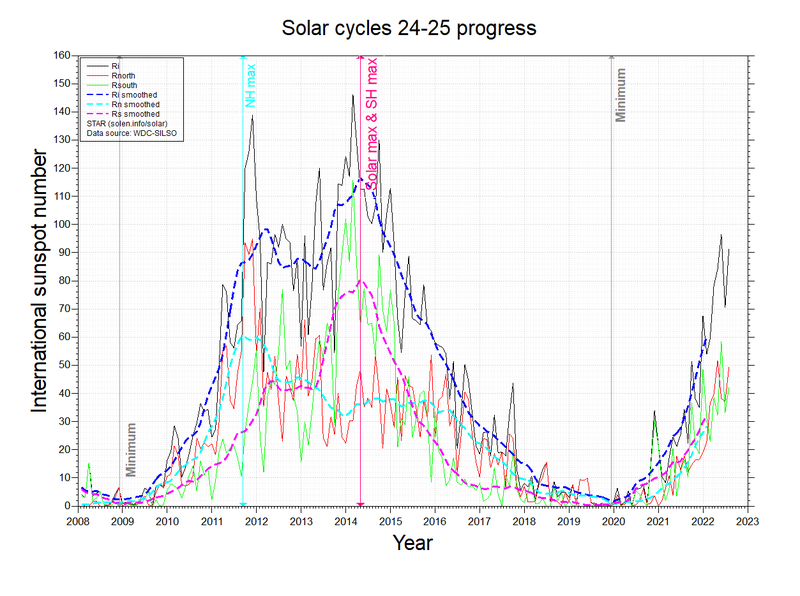 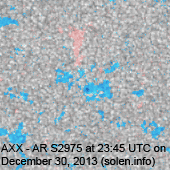 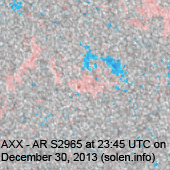 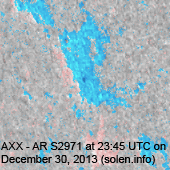 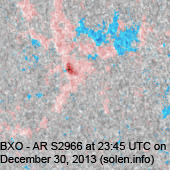 Solar flux measured at 20h UTC on 2.8 GHz was 145.3 (increasing 7.3 over the last solar rotation). 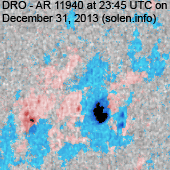 The 90 day 10.7 flux at 1 AU was 140.5. 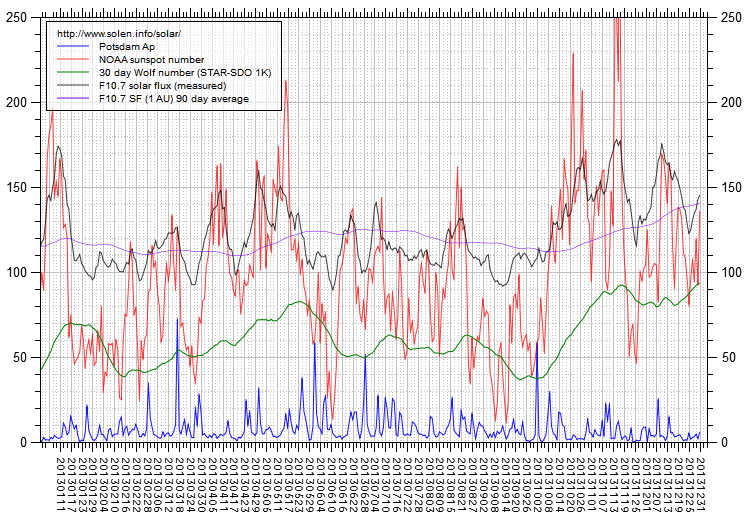 The Potsdam WDC planetary A index was 6 (STAR Ap - based on the mean of three hour interval ap indices: 6.0). 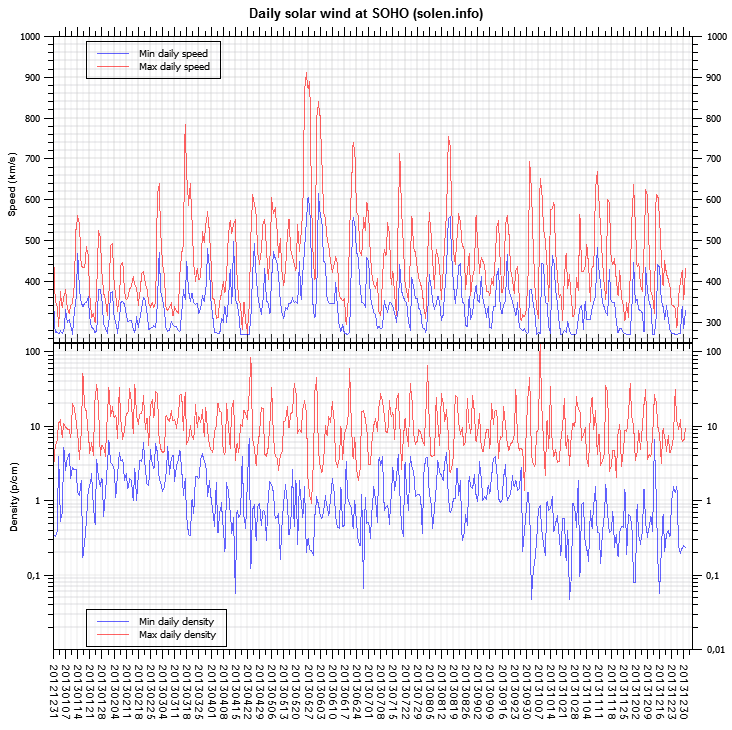 Three hour interval K indices: 21222121 (planetary), 11222221 (Boulder). 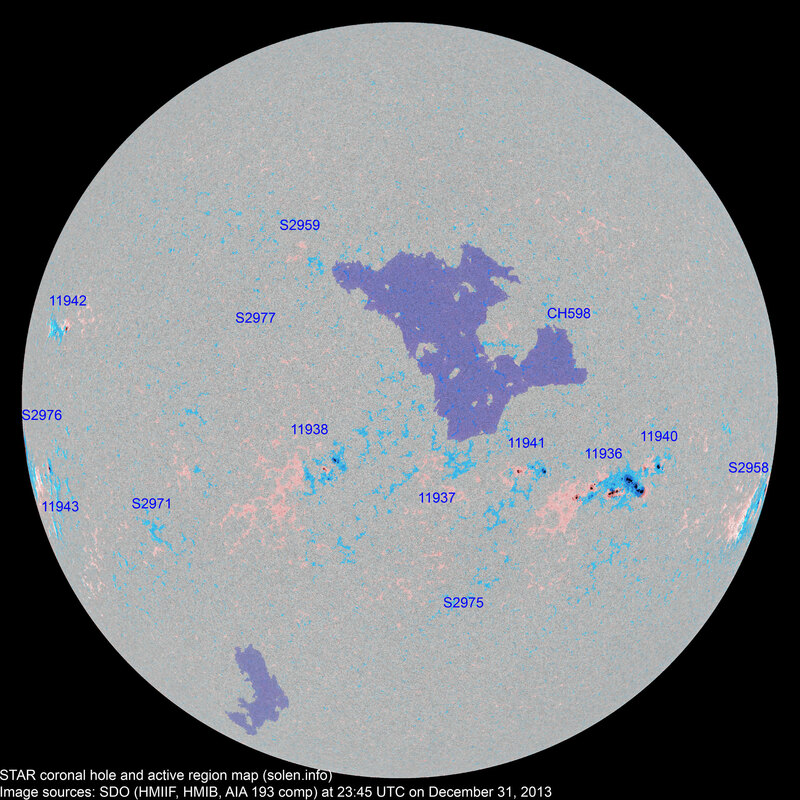 At the time of counting spots (see image time) spots were observed in 13 active regions in 2K resolution (SN: 252) and 11 active regions in 1K resolution (SN: 194) SDO images on the visible solar disk. 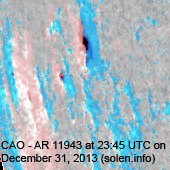 Region 11936 [S16W37] developed a large leading penumbra as several penumbrae merged. 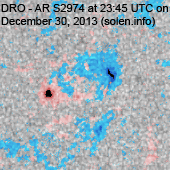 The central magnetic delta structure could cause another major flare. 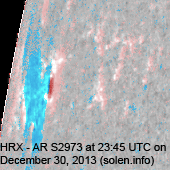 C5+ flare: major M6.4/2N at 21:58 UTC. 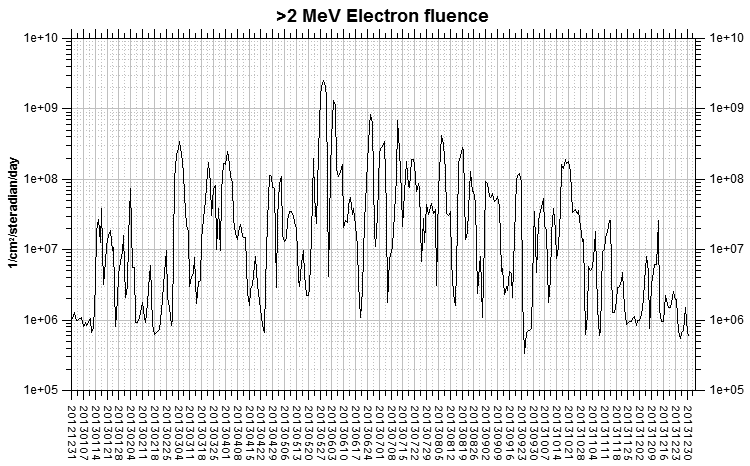 Region 11937 [S12W08] decayed slowly and quietly. 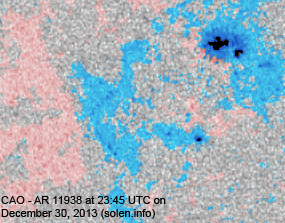 Region 11938 [S13E12] gained a few spots and a trailing polarity umbra. 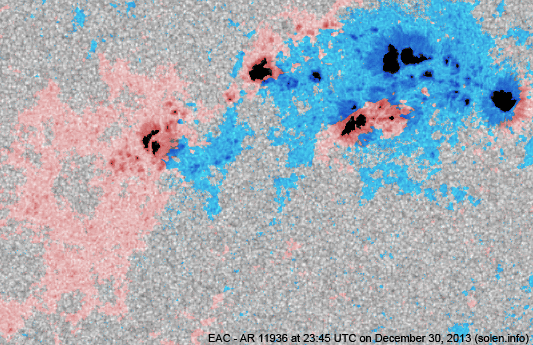 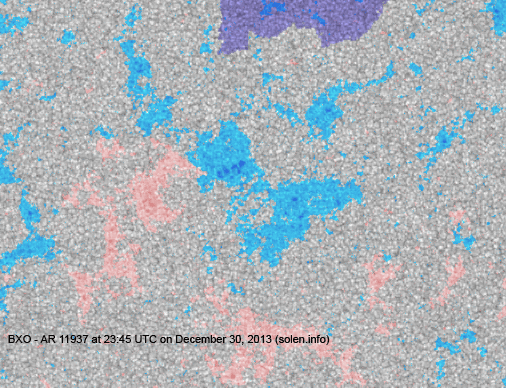 New region 11940 [S12W43] emerged on December 30 and was numbered by SWPC the next day. 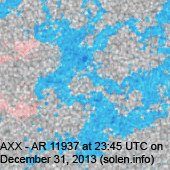 New region 11941 [S14W21] emerged on December 28 and was noticed by SWPC 3 days later. 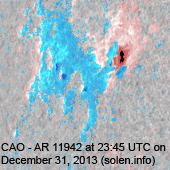 New region 11942 [N09E64] rotated into view on December 30 and got its NOAA number the following day. 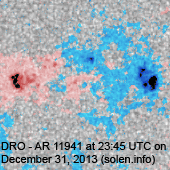 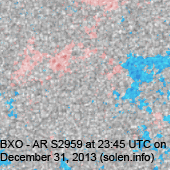 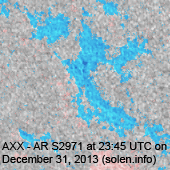 New region 11943 [S12E71] rotated into view on December 30 with SWPC numbering the reigon the next day. 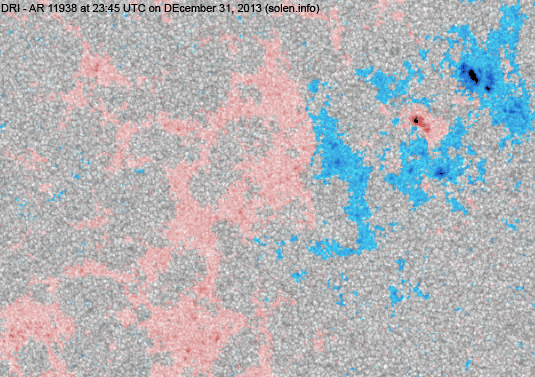 S2958 [S15W82] was quiet and stable and remained magnetically simple structured. 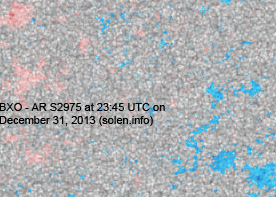 S2959 [N28E16] reemerged with a few penumbra spots. 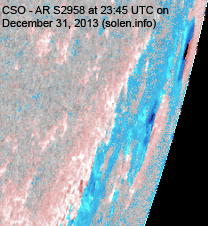 S2975 [S30W12] gained a trailing penumbra spot. 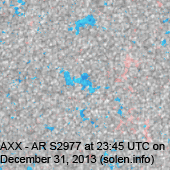 New region S2976 [S07E86] rotated partly into view with a large leader spot. 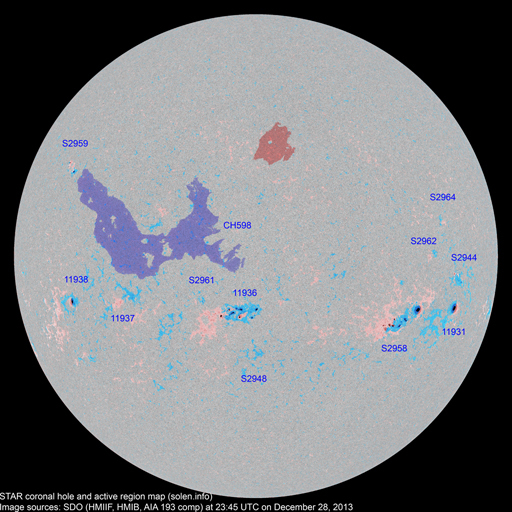 The region could produce a major flare. 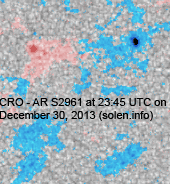 C5+ flare: long duration C8.8 peaking at 11:50 UTC. 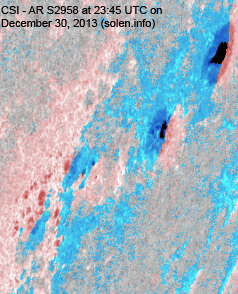 New region S2977 [N24E23] emerged with a penumbra spot. 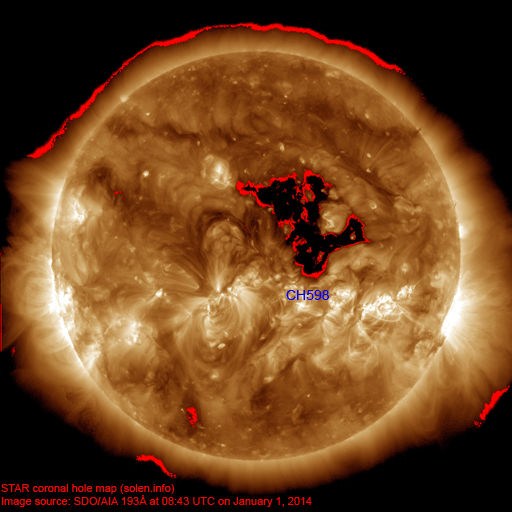 The geomagnetic field is expected to be quiet to active on January 1-3 due to effects from CH598.